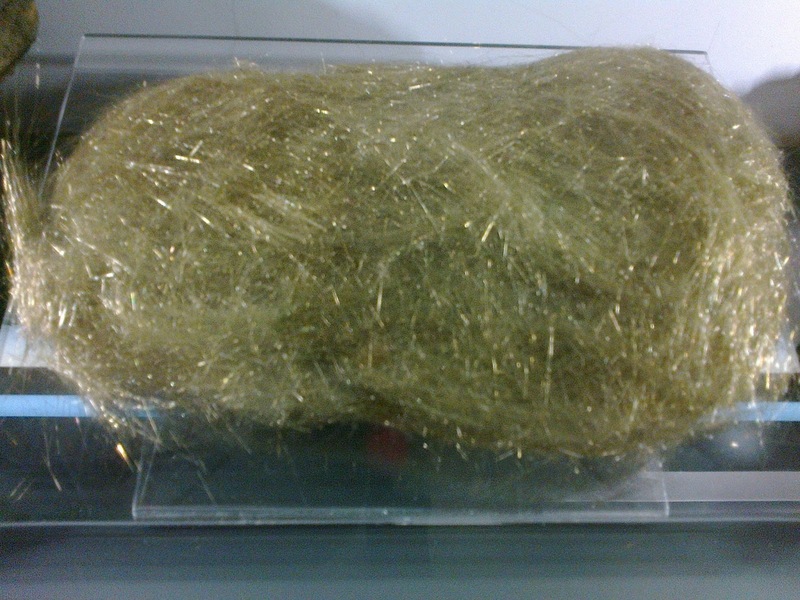 I’d heard of Pele’s Hair but never seen any until I came across some in the Geological section of the Museum of Natural History in Kensington, last year, and was fascinated. Before I show you what it looks like, you need to know the story – or one of the many stories. Pele is the goddess who inhabits the Halemaumau Crater of Kilauea, the most active of the five volcanoes from which Hawaii is formed. (The others are Mauna Kea, Mauna Loa, Hualalai and Kohala.) 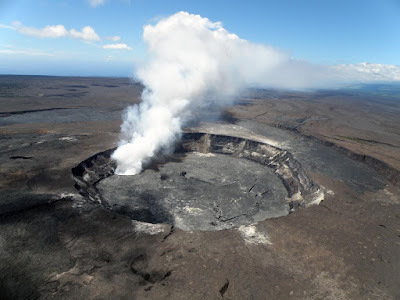 According to the folklorist William D. Westervelt's 1916 book ‘Hawaiian Legends of Volcanoes’, the Hawaiians tell how Pele came from far away with her little sister Hiiaka, and drove out an older volcano god, Ai-laau, to establish her home on Hawaii. Here is a story told to Westervelt in 1905, of what happened when the young chiefs of Kahuku met the fiery and voluptuous goddess. It is a legend which explains the origin of a particular, ancient lava flow from which ‘two symmetrical mounds rise from the rugged splintered rocks. 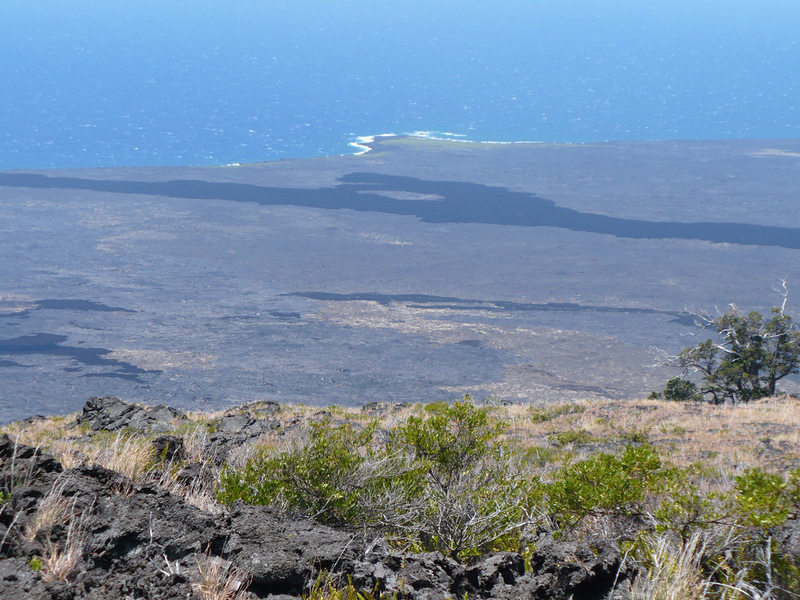 These are marked on the maps of the large island as “Na Puu o Pele” – the hills of Pele’. 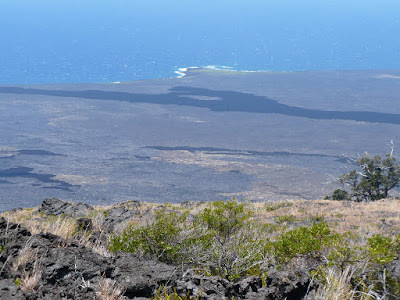 Kahuku, the land now under past and present lava flows, was at one time luxuriant and beautiful. The sugar cane and taro beds were bordered with flowers and shaded by trees. Two of the young village chieftains excelled in the sports and athletic feats popular in those days. Wherever there was a grassy hillside and steep enough slope, holua races were carried on. 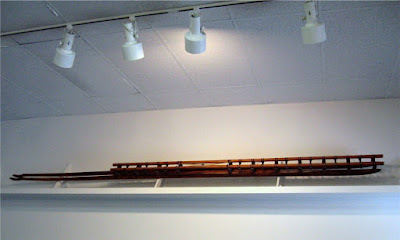 Holua were very narrow sleds with long runners. Maidens and young men vied with each other in mad rushes over the holua courses. Usually the body was thrown headlong on the sled as it was pushed over the brink of the hill at the beginning of the slide. The more courageous would kneel on the sled, while only the very skilful dared stand upright during the swift descent. Pele, the goddess of fire, loved this sport and often appeared as a beautiful and athletic princess. 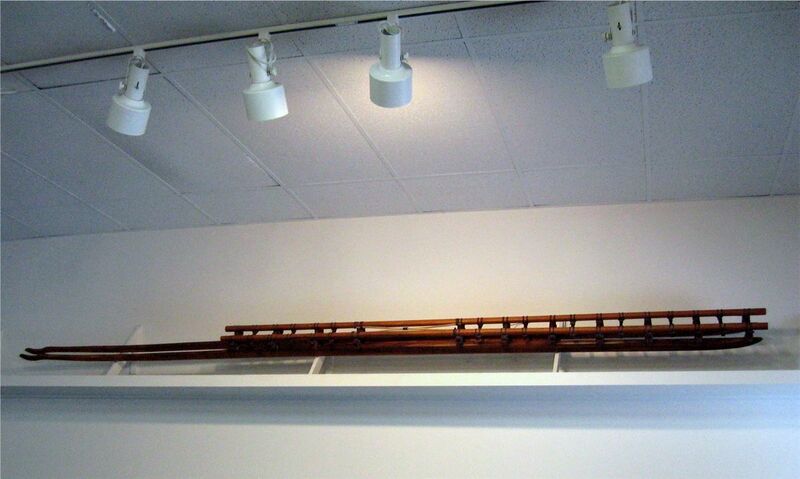 She came to Kahuku’s holua course, carrying her sled, and easily surpassed all the women in grace and daring. When the two handsome young chiefs saw her, they challenged her to race with them, and soon began competing for her love. As the days passed, however, they found her so capricious and hot-tempered that they began to suspect their companion must be Pele herself, come from her home Halemaumau ('The continuing house') of the volcano Kilauea on the other side of the island, able to wield the terrible power of underworld fires wherever she went. The young men spoke privately about their fears, and tried to draw away from their dangerous visitor. But Pele made it hard for them. She continually called them to race with her. Then the grass began to die. The soil became warm and the heat intense. Small earthquakes rippled the ground, and the surf crashed in violence on the shore. The two chiefs became afraid. Pele saw it, and was overcome with anger. Her appearance changed. Her hair floated out in tangled masses, her arms and limbs shone as if wrapped with fire. Her eyes blazed like lightning and her breath poured forth in volumes of smoke. In terror, the chiefs rushed towards the sea. Pele struck the ground with her feet. Again and again she stamped in anger, and earthquakes swept the lands of Kahaku. Then the fiery flood burst from the underworld and rushed down over Kahaku. Surfing the crest of the molten lava came Pele, her fury flashing in great explosions above the flood. The two young chiefs tried to flee northwards, but Pele hurled the fiercest torrents beyond them to turn them back. Then they fled southwards, but again Pele forced them back upon their own lands. With the molten lava at their heels they raced for the beach, hoping to leap into their canoes and take to the sea. At top speed Pele came after them, shrieking like a hurricane, tearing out her hair and throwing it away in bunches. The floods of lava, obeying the commands of their goddess, spread out all over the lands of the two chiefs – who sped on, drawing nearer and nearer to the sea. But Pele leaped from the flowing lava and threw her burning arms around the nearest of her former lovers. In a moment, his lifeless body was thrown to one side and the lava piled up around it, while at Pele’s command a new gush of lava rose from a fresh crater and swallowed all that was left. As the other chief stood petrified by fear and horror, Pele seized him too, and called for another outburst of lava which rose rapidly around them. Thus the lovers of Pele died and thus their tombs were made: to this day they are called the Hills of Pele and are still to be seen as markers by the ocean side. It looks exactly like hair – like the wad of hair you might tease from an over-used hair-brush. 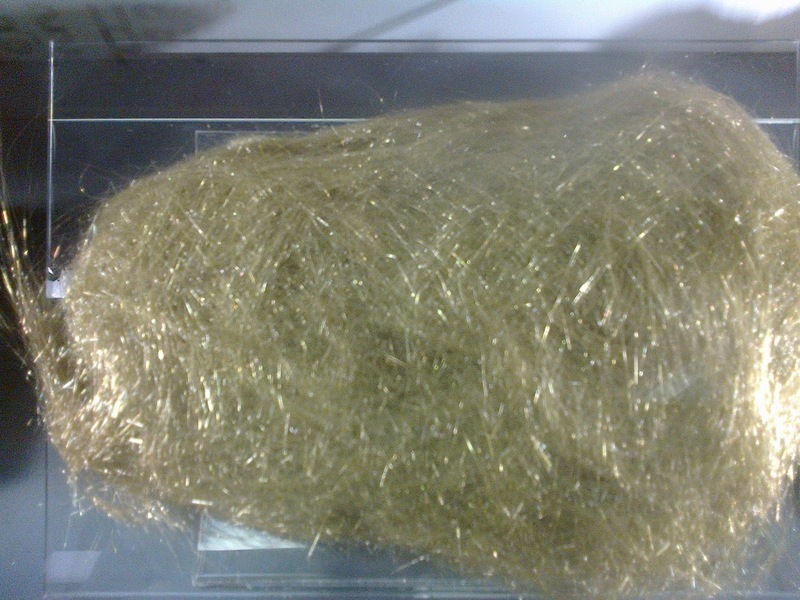 These tangled golden filaments are made of volcanic glass. 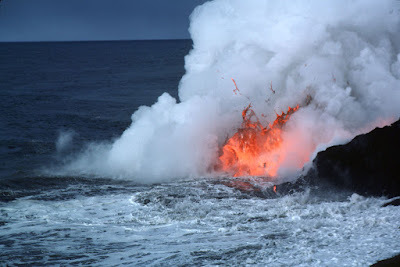 They are formed when drops of extremely hot, liquid lava – the sort commonly produced by ‘shield volcanoes’ like those of Hawaii – are hurled up in fountains and teased out by the wind into into hair-thin strands of basaltic glass – just as when you stretch hot toffee into brittle strands! – light enough to float away and catch like straw in treetops, fence-poles and telegraph wires. A marvel of nature spun by Hawaiian storytellers into the hair of their terrifying and unpredictable goddess. I was in the volcanic Western Isles when this was published, spotting extinct volcanos and calderas all over the place - so couldn't comment then.